Explanation: Aloha and welcome to a breath-taking skyscape. In this celestial scene, a four day old Moon illuminates a dreamlike foreground while bright planet Mars (above center) rules and the Milky Way's cosmic clouds of stars and dust seem to stretch from horizon to horizon. The picture was taken on May 27th from what may be the best amateur astronomy observing site on planet Earth, near the Mauna Kea, Hawai'i Visitor Center, 9,600 feet above sea level. 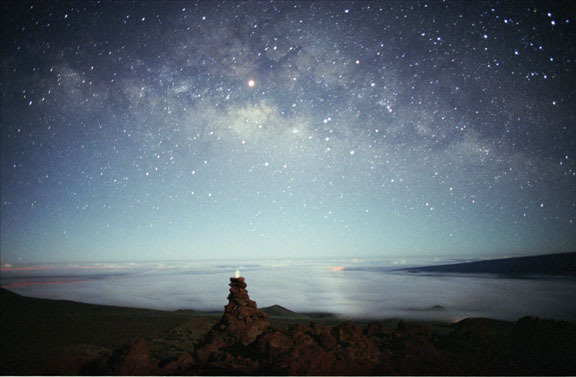 Remarkable in the volcanic foreground are moonlit clouds and an "ahu hoku" - a star marker or star altar - built up of rocks topped with a white piece of coral gently glowing in the moonlight. Now near its closest approach in 13 years, Mars still lingers between the Milky Way constellations of Sagittarius and Scorpius. High above the horizon by midnight, the Red Planet is exceptionally well placed for earthdwellers to admire it. Astrophotographer Barney Magrath comments that this splendid sky view represents one of the joys of photography itself. When making the time exposure he did not realize that the ahu hoku would become such a beautiful element in his celestial composition.